Another highly placed America legal scholar is endorsing gutting the First Amendment in favor of anti-blasphemy laws and censorship. 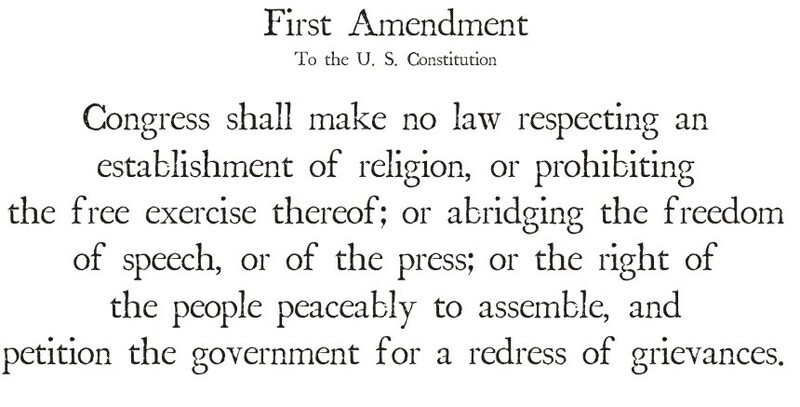 It's the most anti-First Amendment op-ed I've seen yet. It turns out "we overvalue free speech" (foreigners' values are the right ones, so we must abandon ours) and "often free speech must yield to other values and the need for order." So says University of Chicago law professor Eric Posner, who also argues "We have to remember that our First Amendment values are not universal; they emerged contingently from our own political history, a set of cobbled-together compromises among political and ideological factions responding to localized events..."
"As often happens, what starts out as a grudging political settlement has become, when challenged from abroad, a dogmatic principle to be imposed universally. Suddenly, the disparagement of other people and their beliefs is not an unfortunate fact but a positive good. It contributes to the 'marketplace of ideas...'"
Yes, in fact the freedom to examine and criticize people and beliefs is a positive good, and how else will we ever be able to separate good ideas from bad ones? There is no other way other than freedom of discussion. And one can't specify in advance which ideas or criticisms are and aren't permitted -- that would assume we already knew and agreed on Truth. "...as though we would seriously admit that Nazis or terrorist fanatics might turn out to be right after all. Salman Rushdie recently claimed that bad ideas, 'like vampires … die in the sunlight' rather than persist in a glamorized underground existence. But bad ideas never die: They are zombies, not vampires. Bad ideas like fascism, Communism, and white supremacy have roamed the countryside of many an open society." They also don't die if we suppress them, and in fact do fester and grow. Rushdie is right. "So symbolic attachment to uneasy, historically contingent compromises, and a half-century of judicial decisions addressing domestic political dissent and countercultural pressures, prevent the U.S. government from restricting the distribution of a video that causes violence abroad and damages America’s reputation." No, it doesn't cause violence. Religious fanatics and psychopaths choose to engage in violence. If they did not, we would not be having this debate. The video would simply be a case study in bad filmmaking for a few reviewers. "And this is a video that, by the admission of all sides, has no value whatsoever." No! The filmmakers disagree. For that matter, I disagree! I think the first parts, which illustrate the attacks of Salafi muslims on Coptic Christians, and Egyptian state complicity, have merit. Our values have zero weight? Why? Let's take this farther. If I find Posner's op-ed blasphemous and utterly without merit, is that sufficient for me to call for its suppression and his prosecution? If not, how many of us does it take? How big a mob must I organize and how violent must we become? Professor Posner, you're a professor of law, so explain for us the legal criteria your argument implies. I want to know now, in advance, what the boundaries are. What speech will be prohibited? Is it really only that which ex post "causes" others to engage in violence? I'm quite certain that Michael Totten has it right, that these kinds of arguments are equivalent to giving terrorists veto power over our thought, speech, and actions. Conversely, Posner tries to claim that this is just about having a reasonable debate over "whether a government should be able to curtail speech in order to safeguard its relations with foreign countries." Never mind Posner's confusion of religious rioters with foreign states, this point is simply disingenuous. The purpose of our government is to protect our rights from attack by foreigners, not restrict them when foreigners are 1) offended and 2) engage in criminal behavior. What the hell can Posner be thinking? Posner thinks we need to understand "that often free speech must yield to other values and the need for order." In Pakistan, "yielding" to "other values" has lead to what one Muslim cleric calls "the law of the jungle..." If a mob is sufficiently violent, the police arrest the "offender" and courts convict, all in the name of defending the mobs' values and maintaining a pretense of civil order. Note that it is Pakistani Muslims who are recognizing that Islamic anti-blasphemy laws are empowering the worst people in their country. "Law of the jungle" is an apt description. Not all academics have gone mad, of course. Professor of Sociology Mahfooz Kanwar -- a Muslim -- warns that "[t]he blasphemy law is clearly a very blunt and effective tool used to destroy the lives of one’s enemies..." and that "[t]he entire Muslim world, not just Pakistan, is agitating for the United Nations to pass an anti blasphemy law. The rest of the civilized world must oppose this at every turn." Why isn't this obvious to Posner, and everyone else tripping over themselves to abandon the First Amendment? There can be no law but the law of the jungle under Posner's standards. Go ahead and "yield to other values" and you'll see what kind of order that gets us. Oh, dear. Just the title, "The world doesn't love the first amendment," is perhaps the most "who cares?!" fact I've ever read. This is a victory for terror. Not 9/11, or an attack on an embassy, or anything like that. This is how terrorists win. That just goes to show that we should be skeptical (not dismissive) of opinions from "highly placed legal scholars" whose achievements are overshadowed by those of their dads. SG, yes, and in fact we should be skeptical, period. Subject everything to careful scrutiny. I mentioned "Another highly placed legal scholar" to emphasize that these ideas are being developed by people who actually have substantial influence over the development of legal theory and over the education of attorneys and judges, not just some isolated backroom cranks. This is dangerous. PL, your comments were great and Richman's shockingly stupid; and his sudden high opportunity cost -- that's rich! I've started commenting in the same thread; SR ignores me but a few others have engaged. I think they'l lose interest b/c I'm too patient and know too much -- so there's no way to get my goat, and it's easy to refute their Richmanianisms. I think we're miscommunicating, both here and on my blog. "And please, I am dying to read A Farewell to Harm: Sheldon Richman’s Top Ten Crimes Against Reason. I hadn’t paid much attention to his FEE writings until I saw you raise the issue. I want a guide to this chamber of horrors." "OK, how ’bout we make it my guest post on Unforeseen Contingencies?" Yes, by all means, Unforeseen Contingencies would be delighted to host the "Farewell to Harm" celebration. Write it and I'll post it! 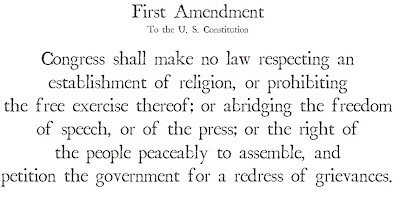 I am completely in agreement with you on the matter of Posner’s ill-conceived attack on the First Amendment and on the universal, inalienable right of free speech. I am so much in agreement that I have republished your article on The Rational Argumentator here. I will have to send you an updated bio, BTW. Who actually have substantial influence over the development of legal theory and over the education of attorneys and judges.